Why does my home need an Automated Gate System? Automated gate systems offer many advantages to homeowners. Are you looking to add more security and privacy to your home property? You can do by having an automate gay system installation completed. This automatic gateway will help you keep unwanted vehicles and people off your property and give you full control of your home access with the click of a remote pad. 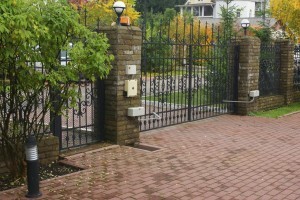 Commonly automated gate systems are iron and steel gates. You have the option of having an automated gate system which swings open or slides open. It is your choice whether the gate is a single panel iron or dual-panel iron. You have the choice of the size and style of your automated gate system. Your automatic gate as your value added home security system. Yes, your automated gate system is about security, but it’s also about style and status. If you look at any luxury new housing development, you will notice most have an automated gate system as a symbol of exclusivity and security. It is a show of modern living for some of the best housing estates in Richmond, Virginia and throughout the United States. In fact, Virginia home buyers expect automated gate systems for housing estates and those featuring an automated gate system often sell quicker. If you plan on putting down a new driveway, be sure to install the automated gate system first to make sure you don’t have to get your new driveway dug up. Before having an automated gate system, you should ask yourself why you want a gate system. This will help you design the best gate system for your property. Some of the benefits of having an automated gate system include security, better curb appeal, an increase in home value, more privacy and security for your family. Remember, if you can set boundaries for your property, you can protect your property from home invasion. How? By making criminals have a harder time getting to your front door. As for the curb appeal, the automated gate will add an artistic flair to your home property, adding to the value and make it easier to sell your home. You will have better privacy as well because the extra security prevents solicitors from getting to your door. You can also put a no trespassing sign on your automated gate system to make sure people respect your privacy. If you are ready to get your security gate installed today, Hercules Fence of Richmond is here to beautify and secure your home. This entry was posted on Friday, October 23rd, 2015 at 12:21 pm. Both comments and pings are currently closed.